Situated in the north-west of Italy and surrounded by the vineyards of Chianti is Tuscany's capital, Florence. The city is an art lover's treasure trove, brimming with Renaissance art and architecture including the stunning Duomo, the fourth largest in the world, which dominates the city's captivating skyline. Add a magnificent selection of museums and galleries containing enviable masterpieces and a staggering number of historic churches, not to mention mouth-watering cuisine and a timeless Italian ambience, and you can see why Florence is such a hugely popular tourist destination. Florence is built around the River Arno, which can be crossed at many points over various bridges. The Ponte Vecchio is one of the most famous of these and is an important landmark in itself. Another good reference point is Santa Maria Novella, Florence's central station. 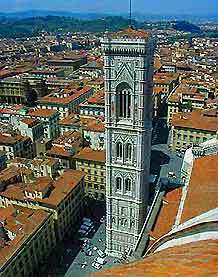 Florence is easily navigable by foot and it's possible to walk across the city in about 30 minutes, using the huge Duomo as an obvious visual reference point. Take a guided walking tour of Florence; it's one of the best ways to see the city's historic attractions and monuments. Catch an art exhibition in the superb Renaissance surroundings of the Palazzo Strozzi. View works by masters including Raphael, Filippo Lippi, Tintoretto, Veronese and Rubens in the beautifully decorated Palazzo Pitti. Head to the shops and secret passageways of the beautiful Ponte Vecchio, Florence's oldest bridge. Delve into the life of the famous artist Dante at the Museum of Dante's House (Casa di Dante). Explore the Bargello Museum; once a prison, the museum now houses one of the most impressive collections of Renaissance sculpture on earth. Climb the 463 steps to the top of the Duomo and enjoy mind-blowing panoramic views of the city. Marvel at pulpits by Donatello, a staircase by Michelangelo and the richly decorated Medici Chapels at Brunelleschi's San Lorenzo Basilica. Kickback at the Simple Gardens (Giardino dei Semplici), a garden oasis that's home to several greenhouses and some small specialist museums. Visit the Michelangelo designed Medici tombs at the Medici Chapel (Cappelle Medicee).